Our model projects aim to modernize apprenticeships in specific trades and to bring them up to Western European standards. To be recognized as a model project, new syllabi need to be developed in close collaboration with the Ministry of Education and according to existing national curricula. Upon successful completion of a model project, it can be replicated in other regions under certain conditions. Model projects are developed in multiple phases. First, we need to identify a suitable partner school that is willing and able to commit to an in-depth restructuring of their training plan. The competent authorities, such as the Ministry of Education, also need to be involved from the outset. Next, working hand in hand with school management and the master craftsmen in charge of the programs, we revise existing curricula. Our particular focus is an increased emphasis of the practical component. We determine the tools and machines we need, revise room plans, renovate classrooms and provide the needed equipment. Simultaneously, teachers are trained in multiple stages. By the time the new training program is launched, teachers will have completed several continuing education courses, some of them in Germany. We also bring master craftsmen from Germany into these schools in order to train the teachers on site. Subsequently, we provide ongoing continuing education opportunities for teachers. After conducting an initial pilot course, we evaluate whether the concept has proven successful and whether other trades can be incorporated into the model project. Once a training course has successfully completed the model phase, the new model will be established as the standard at that school and can then be replicated in others. Ukraine currently has no vocational training program for stonemasons, although the country’s program for carvers is excellent. Technical stonemasonry work is generally carried out by bricklayers. In Lviv, there is a tremendous need for for well-trained, technically skilled stonemasons with expertise in state-of-the-art conservation and restoration methods. The city holds a vast array of architectural riches whose maintenance requires the know-how of these professionals. 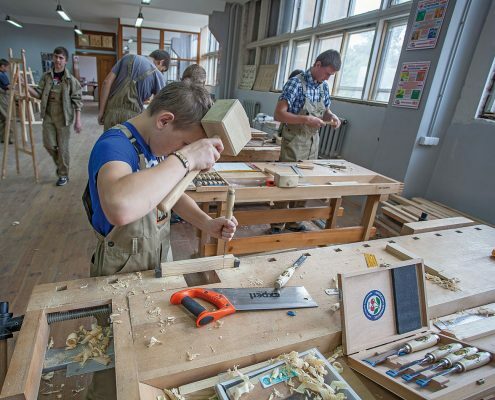 The Lviv-based Irwan Trusch College, which has been training carvers for decades, provides an ideal environment for this program. The six-year artist training program allows students to delve more deeply and broadly into the skillset and enhances its value. A comprehensive restoration and conservation specialization these young artists with added opportunities and new professional perspectives. We have been modernizing cabinetmaker training at this school since 2011. In the meantime, we have fully renovated one workshop, fitted one machine room with modern equipment and equipped a woodshop with the requisite tools. Comprehensive training programs for teachers and master craftsmen were carried out. Currently, the facility has approximately 70 students. The number of students significantly increased after the project was launched. The project in Moldavia is closely tied to the model project in Lviv. For instance, training courses for the students in the master craftsman program in Moldavia took place in Lviv. The new vocational training project for painters, proven effective by our model project in Lviv with the add-on “restorer” qualification program, is currently being implemented at two vocational training schools in Central Ukraine. 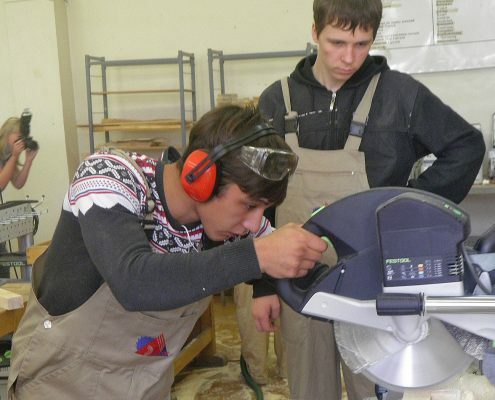 In the fall of 2015, the first renovated workshops were opened and training programs began at the Higher Vocational School for Building and Design in Kiev and the Higher Art and Vocational School No. 5 in Vinnytsia. In December of 2017, we added the “Regional Vocational Training Center for Building and Construction Technology of the Kharkiv Area” in the Eastern Ukranian town of Kharkiv as a third location for the multiplication of the painter training program. The updated training programs at this location were launched in fall of 2018. During an informational visit in May 2016, Ukranian project participants had the opportunity to become acquainted with the German apprenticeship system as well as the country’s painter training program. They displayed enormous interest and we anticipate that this visit will yield numerous impulses for the future of our projects. The modernization of the painter/restorer and carpener/restorer training programs at the Vocational Art College in Lviv has been completed. Continuous follow-up ensures that the training program continues to be state of the art. Due to the tremendous restoration need in the city of Lviv, especially in connection with its status as a World Cultural Heritage site, the added restoration component is a unique feature being offered here. Buildings in the historic center of Lviv are urgently in need of restoration, both inside and out. Here, at the College for Technology and Entrepreneurship, the modernization of the vocational training programs for painters, cabinetmakers, tile setters, roofers, plumbers and automotive painters has been completed. Quality control and sustainability are assured by means of ongoing evaluation and continuing education for teachers at the facility. The multiplication project for tile setters/mosaic layers at the College of Humanities and Technology in Krasnodar has been in progress since 2015. The workshops have been renovated and a master craftsman training project is ongoing. An initial training project with the staff of the model project in Jekaterinburg has been successfully completed. Training sessions in Germany will follow during the first six months of 2016, and the modernized vocational training project is scheduled to begin in the fall of 2016.